This case was purchased from Amazon and I believe it to be a very good case. I got it from Amazon Japan for 3,200 yen, or 27 euros. Here in Spain though, on Amazon, the same case was 95 euros - strange, right? There are other colors which were more affordable. So hunt around for the best price! I have been using it for a few weeks now. I must say that I am in love with it. It does take the weight up quite a bit, but it definitely screams quality. It took me a day's use to learn how to properly open it and get the keyboard to open on right in front of me, but that's it. To insert the SP4 into the case you must slide it in from the bottom and have the top slide in to the notches on top. Then you open the kick stand a little and snap the kick stand into each of the place holders for it. It's very simple to remove it from the case, unlike the UAG case (review to come, another very nice case). But it was very simple to remove just by reversing the process - unclip the kick stand and then slide the top out through the bottom. I've been using it for well over a week, and I have been using it 24 hours a day 7 days a week. I use my Surface for about 7-8 hours a day for work reasons and this case has been on it ever since. 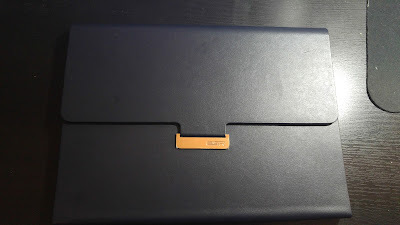 It's a case, so it's there to be abused since it's what gets thrown into my bag - that way the case takes the abuse and not my shiny Surface Pro 4. One of my favorite things is that it uses the already awesome kick stand mechanism of the Surface Pro 4, which means you can get almost every angle that the SP4 does. The keyboard can no longer be folded back though, bummer. But the case actually offers VERY good stability while sitting on a plane, train, bus since it essentially mimics a laptop dynamic, all the while keeping the heat off your lap :). It has a magnetic clasp which will help it stay closed, I say help because it won't lock it in place. It'll just give you an idea that it's there and won't open by itself in your bag, but it's VERY simple to open. The device can still be charged with the case on, even with my custom 3D printed cable protector. It also has a pouch on the inside for business cards or a sheet of paper or something like that. I honestly don't see the use of it. + Pen is securely locked in at the top. - Depending on where you are, it's expensive.